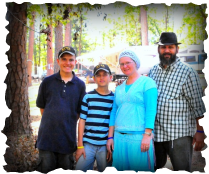 Blessings from Mashiach! We are Jesus, Tammy, Christian & Christopher Montañez. Former Baptist Outreach Missionaries and missionary pastors to the Hispanic, Children Ministry Directors(6 years), Master Trainers for Children and Youth Ministries now converted and turning back to the truth of the Living Torah and the Hebraic Roots of Yahshua our Messiah. Following the calling YHWH laid in our hearts we ministered to the Hispanic Churches of Florida for 3 years and then moved to Texas for recharge and unlearn the lies we inhertited from our fathers. 6 years ago we thought we were going to drive through Mexico to Panama. YHWH closed the doors for us and the Passover we were going to attend in Guatemala was canceled. We stayed in Texas and He became the focus of our lives. Everything was provided for a year. Families blessed us enormously and their families became our families. We met Yisra'El and we met people that for the first time had saltiness in their conversations and shed a light rarely seen in people we met before. Wisdom increased and our eyes where opened. We started to walk, talk, think and live differently. Torah life became our life and YHWH prepared us for a journey that we never expected. We were invited to go to UK and we agreed. We left TX to come to FL and the plans were to leave FL in a month. Weeks later the plans changed and the trip was canceled again. We continued to ministry faithfully to those that YHWH placed in our path and visited many homes to explain the change in us. Walking the Walk works. In Turning back there is Healing, there is Shalom, there is Life. HalleluYAH!!! What a year!!!! Now we are just where we felt we were going the first time. The Harvest is ready the workers are few! Isa 58:6–14 "Is this not the fast that I have chosen: to loosen the tight cords of wrongness, to undo the bands of the yoke, to exempt the oppressed, and to break off every yoke? "Is it not to share your bread with the hungry, and that you bring to your house the poor who are cast out; when you see the naked, and cover him, and not hide yourself from your own flesh? "Then your light would break forth like the morning, your healing spring forth speedily. And your righteousness shall go before you, the esteem of יהוה would be your rear guard. "Then, when you call, יהוה would answer; when you cry, He would say, ‘Here I am.’ "If you take away the yoke from your midst, the pointing of the finger, and the speaking of unrighteousness, if you extend your being to the hungry and satisfy the afflicted being, then your light shall dawn in the darkness, and your darkness be as noon. "Then יהוה would guide you continually, and satisfy your being in drought, and strengthen your bones. And you shall be like a watered garden, and like a spring of water, whose waters do not fail. "And those from among you shall build the old waste places. You shall raise up the foundations of many generations. And you would be called the Repairer of the Breach, the Restorer of Streets to Dwell In. "If you do turn back your foot from the Sabbath, from doing your pleasure on My set‐apart day, and shall call the Sabbath ‘a delight,’ the set‐apart day of יהוה ‘esteemed,’ and shall esteem it, not doing your own ways, nor finding your own pleasure, nor speaking your own words, then you shall delight yourself in יהוה. And I shall cause you to ride on the heights of the earth, and feed you with the inheritance of Yaʽaqoḇ your father. For the mouth of יהוה has spoken!" Pray for our Servant Family, Shalom!